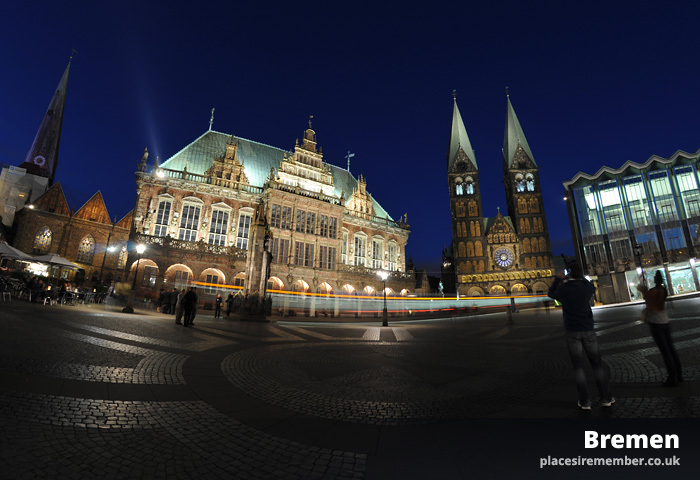 Situated 37 miles inland from Germany’s northern coast is the historic city of Bremen. Known partly for its significance during the second world war, during which time it was one of the most bombed German cities outside of Berlin, it’s somewhat of a surprise that there is so much of its rich history still evident. But some of the city’s most impressive architecture was, miraculously, left untouched by the thousands of allied planes that flew many missions over the strategic city. As such, Bremen’s Altstadt has retained much the character that its centuries-old architecture gives it. Compact as it is, the old town can be reached on foot from the main train station in just 10-15 minutes, or by tram from the airport in a similar amount of time. The city’s central point of focus is Marktplatz, a square enclosed on three sides by 15th and 16th century buildings that include the UNESCO world heritage listed Rathaus (town hall), and the Schütting, located opposite and the current home to the city’s Chamber of Commerce. Set back slightly from the square’s north east corner, as peering nosily through the gap, is the Dom, the city’s sky-scraping cathedral. With its twin towers, finished in copper as is typical of the era for many high profile buildings and churches throughout Germany, the cathedral also acts as central Bremen’s focal point for many miles around. Immediately to the south of Marktplatz is the quirky Böttcherstraße, with yet more old architecture towering both sides of the street – some of which has had to undergo bomb repairs. A few blocks to the east is the Schnoor quarter, a medieval district of old streets and houses that date as far back as the 15th century. Originally home to some of Bremen’s poorer residents, the buildings are now used as outlets for independent retailers that help to maintain a highly unique setting. With items for sale that range from individually-made clothing accessories to fine chocolate delicacies, it’s seems only right to spend not just time exploring, but also some currency as well. While the city centre doesn’t have a particularly busy feel to it, there is every chance that narrow streets – such as those within Schnoor – can feel quite congested. Fortunately, Bremen has the perfect answer for everyone wanting to get away from it all: Bürgerpark. Measuring 2.7km in length and covering 202 hectares, Bürgerpark is a vast area of green space located a short distance north of the Hauptbahnhof (main train station). Marking the south entrance is a small circular lake, overlooked by a 70’s style hotel, while further north within the park, there is a large children’s area, a crazy golf circuit and a boating lake from which rowing boats can be rented. If it all sounds like there’s little to do when the rain comes, Bremen has something to offer during the bad weather, too. Renowned for its production, the city is home to the Mercedes car factory, and the Beck’s brewery – both of which can be toured. There’s also a science museum located on the north-east corner of Bürgerpark, and is easily reached by public transport (for which a free voucher is given when checking into any of the city’s hotels). Of course, there is no shortage of good pubs throughout the city, many of which also serve homemade meals that may reshape previously formed opinions on German cuisine. It’s unlikely to be high on many people’s list for a two-week summer holiday, but with a compact city centre that is so easily reached by plane or train, Bremen has all of the ingredients of a perfect destination for a short city break.